BRIEF CAMP DESCRIPTION: Reptile Encounters Camp is an adventure into the world of herpetology, perfect for young reptile/animal enthusiasts! This conservation based day camp utilizes interactions, observations, and STEAM lessons about the turtles, snakes, lizards, and crocodilians at the PHS Sanctuary. We also have specialty camps like Vet Camp, Croc Camp, & Snake Camp! We also have day-camps year round for extra time with PHS animals on school breaks! SPECIAL NEEDS CAMPERS: We have special needs campers in many of our camp sessions and do our best to make every possible accommodation so that they may also receive the camp experience. CAMP LOCATION: We are located in north Scottsdale, near the major cross streets of Dynamite Blvd. and Scottsdale Rd. We are approximately 6 miles north north east of the Loop 101/Scottsdale Rd. exit. CAMP FACILITIES: PHS is a non profit reptile sanctuary with over 1700 animals. We have two classrooms in our Conservation Center which has multiple avenues for technological opportunities, including research and experiments. Some camp activities will occur outdoors, as many of our animals are housed in outdoor enclosures on our 2.5 acre property. CAMP PROGRAM INFO: The Phoenix Herpetological Society believes that "Conservation Begins With Education" and that youth are truly the future of many of our creatures. 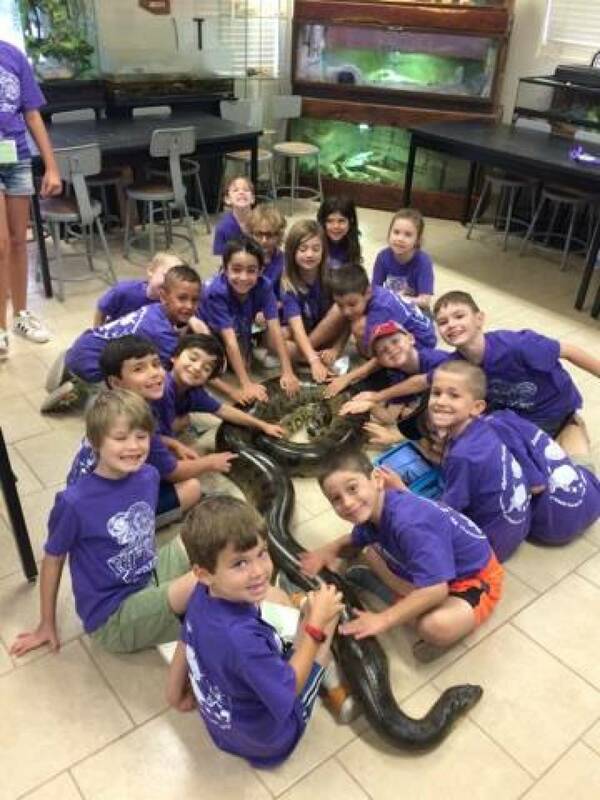 The Reptiles Encounters Summer Camp has received glowing reviews from campers and parents, who are always wow-ed by the experiences the campers have while at the PHS summer camp. CAMP LEADERSHIP CIT/LIT PROGRAMS: We do offer limited counselor in training programs for teenagers who want more of a leadership role in the camp process. Preference is given to campers with previous PHS experience, but new campers are also welcome. We use the same application as the campers, but require the potential CIT to come in to the sanctuary for a conversation with his/her parent or guardian about what the CIT responsibilities include so that everyone is on the same page. CAMP SCHOLARSHIPS OR FINANCIAL ASSISTANCE: Scholarships are available on a limited basis and require an additional application. YEAR-ROUND PROGRAMS: PHS offers educational events, family outings, and school programs all year long, including special events and tours of our sanctuary. Email the PHS Director of Outreach at katelyn[AT]phoenixherp.com for more information or for a copy of our Educator Resource Guide. For summer camps, cost is $275.00 per week per student, except for Croc Camp & Vet Camp which is $300 and the 6 - 7 Year old Neonate camp which is $150. We are currently accepting applications for (unpaid) Summer Camp Education Interns. Applicants should be enthusiastic and passionate about reptiles and conservation and should have some previous experience with reptiles and/or informal education. Email katelyn[AT]phoenixherp.com for formal job descriptions or more information in general. Please include resume, cover letter of interest, and three references.